I had never been to the Crescent City before Thursday. Thanks to the 2014 Cruise Holidays convention, I finally get to cross this off my bucket list. I’ve heard so much about New Orleans that it got to the point where it all felt cliché. Could any city really be that much? 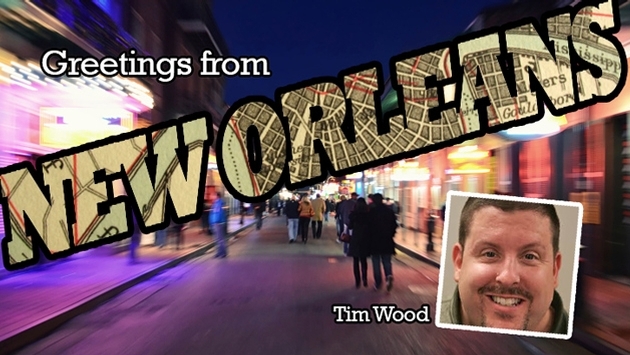 “Oh, you’ll see,” said Jason Timmons, an off-duty bartender and recent New Orleans transplant who saved me from a very persistent greeter at one of the slew of debauchery factories on Bourbon Street. I was spent after the first day of convention festivities but I had to get a taste. And to be sure, there was plenty of cliché to be had on Bourbon Street, finely represented by a chorus of drunken frat boys who started stumbling around the tattered cobblestone after one large daiquiri apiece. I know. I watched them. I couldn’t look away. Turn one way, you have incredible jazz and mouth-watering seafood. Turn the other way, you are hit with every brand of, um, adult entertainment. Hustler, Penthouse, Rick’s Cabaret, Scores, all the big players (or so I’ve been told) are there. Police on horseback keep just enough peace. It is such a high-wire act of civility. At any one moment, it feels like a happy-time riot could break out anywhere you look. And this was on an unseasonably cold night. I try not to be too blatantly touristy when I’m traveling, but boy, this was hard. Peter Hanrahan was feeling my pain. The Cape Cod native was also making his first trip to New Orleans and he was getting whiplash from all the people watching. This was just my scouting night. I had to be up too early to give the attention that the French Quarter deserves. I was able to soak in a couple genius cocktails at Arnaud’s and Kingfish. I made new friends at the “Bar Rescue” bar, Resurrection, which was thriving on this night. And I got a quote on a bike taxi ride from the hotel to Café du Monde. Oh yes, there will be beignets.